Do you want to view history of customer's order in one click? This extension keep track about origination of customer i.e google adwords, google shopping , facebook and other. It also provide detail report about orders so store owner can keep track which marketing channels are generating more sales. Add this extension at your Magento store, so you can easily view the whole history of customer purchases in a few clicks. With our Sales Origination Magento Extension it's reality. Save time that you spend on orders management. Provide detail report of sales of your product, so you can easily view who, when, from where and how much purchased this product and what's the order status. This extension contains filters, admin can view the data with respect to their status and origination for any specific period of time. 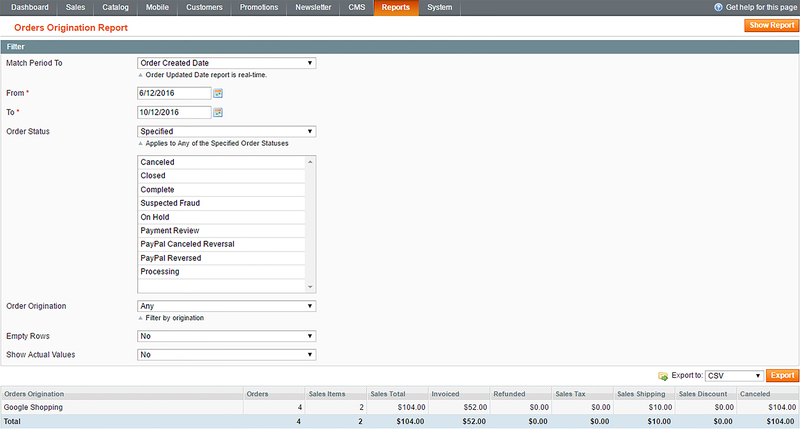 Specified order tab generate results for the selected specific order status. This feature provides information about origination of orders, it keeps track of all placed orders with their origination, admin can also view the record of placed orders for any specific origination. Admin can access this extension in the sales report located in the Reports tab. This extension includes a drop down list in the city field if any state/province of Pakistan is selected, Providing an ease to the customers while restricting them from entering invalid information. Payfort Payment Gateway Magento Extension adds option to your store for payment methods.Upon adding this extension to your Magento store, your customers will be able to complete payment through Payfort Gateway. This extension provides two gateways (Telenor and Twilio) for sending messages to the customers.In order to authenticate them and confirm order on success page.